Wendy's 3-D Cats: HAPPY NEW YEAR DOMINO-STYLE! Domino is all dressed up in her glitter dress and is ready for dancing the night away with her beau, Milo. She's sweet but quite impatient, and just cannot wait for him to show up. "Get a move on, Milo -- TOOT SWEET! ", she says. She's not just blowing her own horn. Domino hopes everyone has a blast tonight, and smooth sailing throughout 2012 -- even if it takes an icebreaker to do it! "I'll have my niptini on the rocks, she says!" Happy New Year and wishing you a prosperous, Healthy 2012! From all of us to all of you...Happy, Happy, Happy New Year!!! Have fun with Milo - Happy New Year!!! I take my niptini straight up! 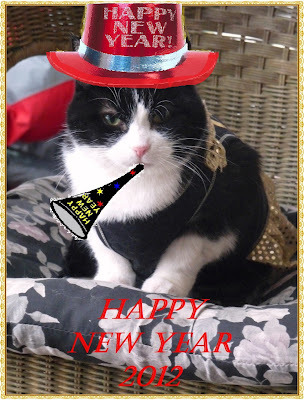 Happy 2012 to all of you, and may the whole year be a kitty party! Happiest of New Years to you all! Happy New Year, Domino and the rest of the cats! Yay! Happy New Year to Wendy and her 3-D Cats! May 2012 treat you well in all ways! Hope you had fun dancing the night away!